It was a huge relief to get out of Paris and away from its mad drivers. I was to discover later that Paris is the only place in France where the drivers don't treat cyclists with respect. The route South took me past Paris Orly airport, along a old Route Nationale. It's a good long distance today, but not at all hilly. I stop for lunch at Fontainebleu, which was one of the royal courts and sits in the centre of what must have been a huge forest. 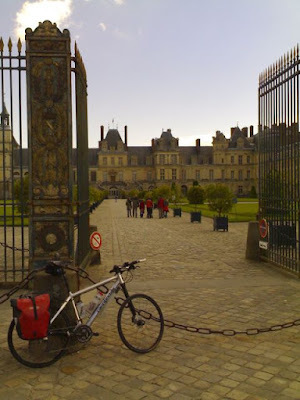 The afternoon is a long, but enjoyable, ride through the French countryside to join the Loire - starting with Nemours. I heard my first cicada and saw my first vineyards of the trip and also, very much out of place, my first French nuclear power station next to a lovely village on the Loire. They're really into their nuclear power, the French. 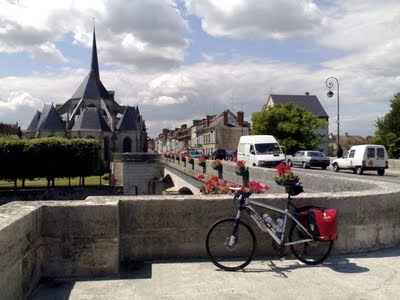 Despite being a long day I made it to the small town of Cosne-Cours-sur-Loire feeling pretty good. Staying in a very sweet old coaching inn and had a fantastic five-course set meal, with a bottle of red wine and a lovely selection of local cheeses that I was talked through. Ah the French, they really know how to live! I'm starting to think that I might be getting the hang of this - although I'm bound to regret saying that when I get to the mountains!